In the Mazowe area some 40 km NW of Harare in Zimbabwe, gold mineralization is hosted in a variety of lithologies of the Archean Harare-Bindura-Shamva greenstone belt, in structures related to the late Archean regional D2/3 event. Conspicuous mineralzogical differences exist between the mines; the mainly granodiorite-hosted workings at Mazowe mine are on pyrite-rich reefs, mines of the Bernheim group have metabasalt host rocks and are characterized by arsenopyrite-rich ores, and Stori's Golden Shaft and Alice mine, both in metabasalts, work sulfide-poor quartz veins. In contrast to the mineralogical diversity, near-identical fluid inventories were found at the different mines. Both H2O-CO2-CH4 fluids of low salinity, and highly saline fluids are present and are regarded to indicate fluid mixing during the formation of the deposits. Notably, these fluid compositions in the Mazowe gold field markedly contrast to ore fluids “typical” of Archean mesothermal gold deposits on other cratons. Stable isotope compositions of quartz from the various deposits (δ18O=10.8 to 13.2‰ SMOW), calcite (δ18O=9.5 to 11.9‰ SMOW and δ13C=−3.2 to −8.0‰ PDB), inclusion water (δD=−28 to −40‰ SMOW) and sulfides (δ34S=1.3 to 3.2‰ CDT) are uniform within the range typical for Archean lode gold deposits worldwide. 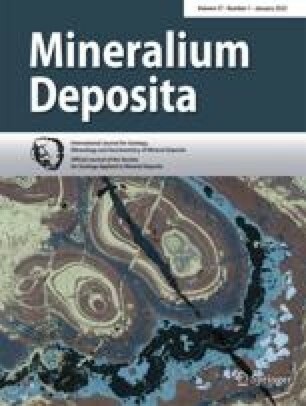 The fluid and stable isotope compositions support the statement that the mineralization in the Mazowe gold field formed from relatively reduced fluids with a “metamorphic” signature during a single event of gold mineralization. Microthermometric data further indicate that the deposits formed in the PT range of 1.65–2.3 kbar and 250–380 °C. Ages obtained by using the Sm/Nd and Rb/Sr isotope systems on scheelites are 2604 ± 84 Ma for the mineralization at Stori's Golden Shaft mine, and 2.40 ± 0.20 Ga for Mazowe mine. The Archean age at Stori's is regarded as close to the true age of gold mineralization in the area, whereas the Proterozoic age at Mazowe mine probably reflects later resetting.